Adriana Villagran interviews Angela Gram, a painter, writer, and educator living and working in New Jersey. She received a MFA from the New York Academy of Art and a BFA from Rhode Island School of Design. She is also a co-founder of the blog Quantumartreview, a source for art criticism, essays, and interviews that investigate the intersections between contemporary art and science. In this interview, she delves into the imagery of her past work in the context of her most current series and the influence of the larger contemporary art community she is tapped into. ﻿What is the concept behind your 2012 series with the bodies strewn as the landscape and the animals crawling over them? 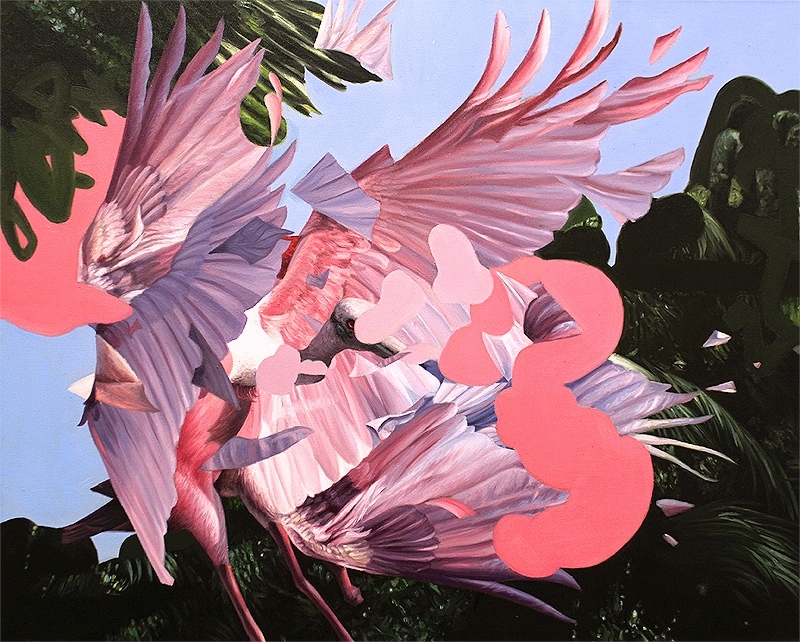 How do these 2012 paintings inform your new work? 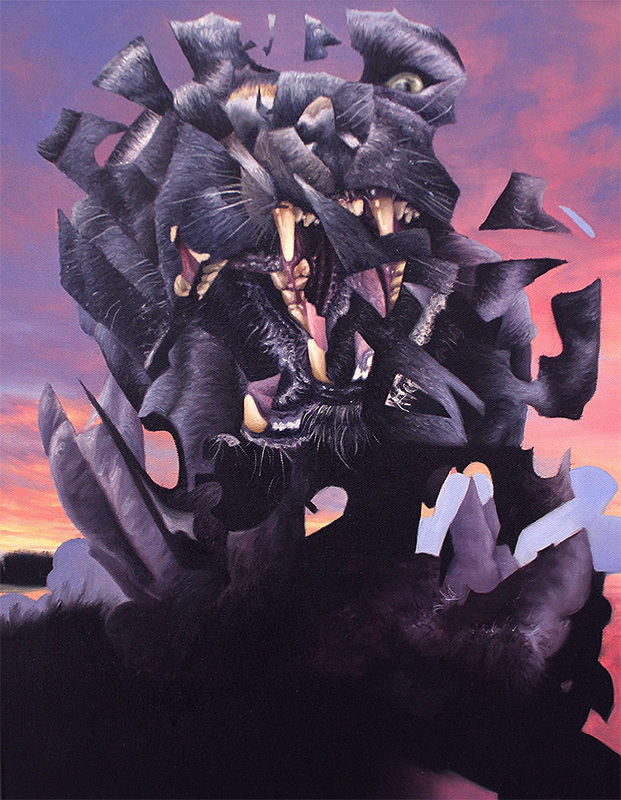 The new series of fragmented animal bodies is directly informed by my previous work in a reactionary sense. I’ve decided to embrace the contemporary discourse on animals instead of challenging it as a hierarchy between humanity and nature that can be reversed. The reality of Western society (where physically experiencing the natural world has become completely irrelevant), is that animals have lost any ingrained societal context or meaning beyond the pulse of environmentalism. Animals have come to exist merely in the modern imagination, and the realm of the mind distorts and allegorizes and projects onto them. This is why I think current animal imagery has such a discordant tension to it. The subject is physically absent, and therefore culturally meaningless. There’s this kind of irksome reaction when we see something and can’t place it. Being the formalist that I am, I’ve chosen to represent this by deconstructing the animal body. They are fractured, irrational, chaotic and completely lacking an identity. I’m still developing the basic structure of these paintings and need to resolve several issues such as the tactility of paint, and what to do with the background. 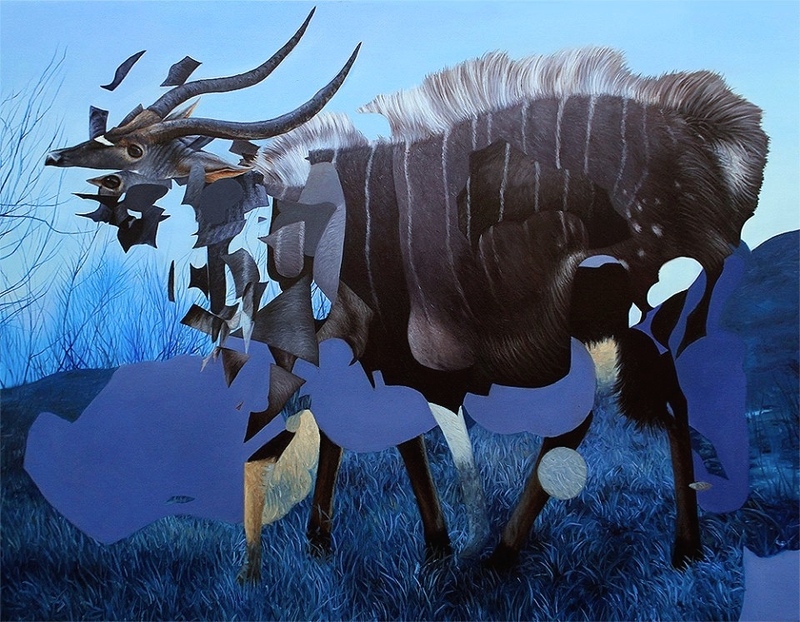 I would like to eventually have a more narrative space where the animal is still fragmented but directly placed in it’s actual environment, and perhaps exhibiting a certain behavior or interacting with its own species. This could ground the work with a sense of spatial realism while the animals themselves in contrast disperse into nothingness. To what kind of animal imagery are you specifically referring? I was originally referring to animal imagery in the sphere of contemporary art because for me, this is the most potent example of expressing this subject's current status. Artists really create tangible sociological evidence of what the cultural conversation is on any given subject throughout history, and the human relationship with the natural world is one of the most primordial and persistent of these dialogues. This conversation still exists today, but it does so completely lacking the natural world as a subject rooted in everyday reality. As I mentioned above, animals retain their value as a vehicle for self expression but without a direct cultural reference point, the imagery becomes rather psychological. This is a critical point of departure and at its core, any current form of animal imagery from film and literature to even a child's toy, becomes automatically idealized. It represents something that is no longer vital to societal functioning, and simultaneously asserts how animals are symbolically embedded in our collective psyche. What did you focus on at RISD? How has your formal education informed your current art practice? I graduated from RISD with a major in illustration, and can summarize that experience as intense technical instruction with an emphasis on critical thinking. It was profoundly valuable learning how to visually communicate concepts in an immediate way. However illustrators are ultimately controlled by the decisions of their cl﻿﻿ient and the curriculum was structured accordingly. I went through the program making large scale oil paintings and realized retrospectively that this was not a very appropriate thing to do, and that I had no idea what contemporary art was. Out of a rather determined curiosity I decided to pursue painting and completed my MFA at the New York Academy of Art. This was nothing short of a life-altering exercise in self discovery, as I navigated how to develop my work not only personally but also within the context of a larger contemporary discourse. My peers and instructors offered a perpetual exchange of ideas and opportunities. I was encountering all of this for the first time amidst the blinding stimulation of the New York art world, and had only two years to assimilate everything I was learning into my work. It felt exhilarating and treacherous, a very rare and special time. I think that describes most art students’ experiences during their undergraduate work. What specific dialogues from the contemporary art world triggered your MFA work? The most surprising realization for me was that my personal reasons for developing the MFA work, actually aligned with a dialogue at all. It is vital to clarify that the conceptual development initially was all very introspective as I tried to navigate what I cared about and why. I was raised in New Hampshire wilderness and have carried a sensitivity to my environment throughout my life. From the vast and at times foreboding landscape, I internalized a dynamic atmosphere with many aesthetic emotions attached to it. Nature was viscerally real for me, and I rebelled against the reality of it being marginalized to the point of spectacle or mere conversation. This was really the beginning of finding myself in a reactionary position where I wanted to challenge that current dialogue on nature instead of embracing it. What did you work on at your most recent residency? What new lessons did you come away with? My last residency was with the Eileen Kaminsky Family Foundation at Mana Contemporary in Jersey City, NJ. 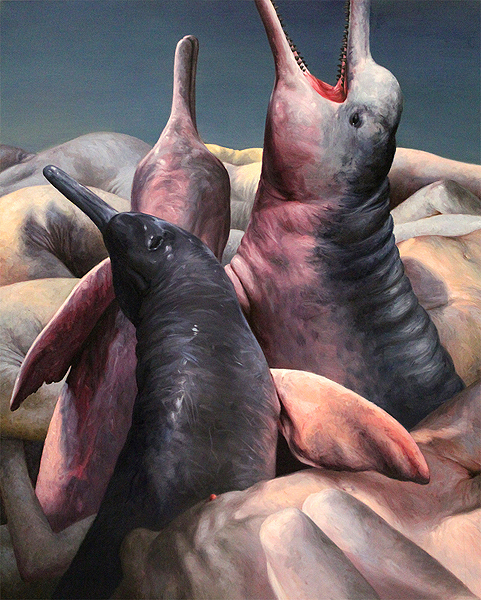 It was a three month period where I began my new series of paintings that explores fragmenting animal imagery. My process has always been meticulously precise in the sense that there is no allowance for deviation from what I’ve planned for a piece beforehand. The execution is merely execution. It’s a very inorganic way of painting but the idea stage is where I can really discover new things. I’ve realized the amount of time needed to fully develop these pieces is inconceivably frustrating, but that’s really ingrained in any artistic endeavor. Persistence usually leads to what I want to achieve in the end. Do you ever feel constricted by this non-deviation? What would be your ideal way to let loose with your painting? Great question! Honestly sometimes I do feel restricted by my process, but it is also something that developed intrinsically. I've always approached painting in a kind of analytical, problem-solving method that guarantees the results I'm looking for. Perhaps on some level I'm just terrified of failure .... and inefficiency. I would love to eventually paint more from my imagination instead of using photo references. I could kind of do this decently at RISD through illustration but have since lost those skills. There's a lot to memorize if you're going to pull it off convincingly. You are the co-founder of Quantumartreview.com which investigates the intersections between contemporary art and science. So what intersections have you discovered? I founded Quantumartreview with Jacob Hicks, a very talented painter, writer, and fellow science enthusiast. Art and science are essentially kindred disciplines. They are vital methods of measuring the human experience. The former being a more intuitive, introspective form of investigation and the latter representing formal empirical analysis. Inquiry fu﻿﻿els the development of both fields and a paramount example of such simultaneous flourishing is perhaps the Italian Renaissance. A classical polymath such as DaVinci uses multiple scientific investigations to directly inform his visual work and inventions. Contemporary artists in this dialogue seem to delve into the unknown. Some are interested in tenuous existential questions manifesting from the “threatening” speed of advancing technology. This seems to be a consistent trend in the zeitgeist. The Quantum in our title not only represents the minutia of journalistic investigation. What prompted you to start and share this investigation? It began as a conversation within my group of friends, many of whom are artists and also curators. We immediately realized that the blog had potential to become an incredibly powerful resource for ourselves and others. We wanted a platform to share opinions, have discussions, and highlight the work of emerging artists. Where do you see Quantum going in the future? The immediate goal is to increase readership and exposure. We are thinking about a group show for all artists included in the blog so far. It will be a showcase for them while providing viewers with a physical sense of what Quantumartreview is about. We also plan on printing first edition magazines to be available at the opening and online. Time and commitment will hopefully yield greater opportunities. Feel free to plug a particular piece from Quantum that you think is particularly noteworthy. Which article would you choose that illustrates what your blog is all about? This is difficult since we have various writers contributing on a wide range of topics. There is perhaps no single article that is all encompassing. I would rather direct readers to our latest review by Jacob Hicks of a group show at Mark Miller Gallery titled “Hot Dry Men, Cold Wet Women” seen here. Have any of the artists you’ve worked with through Quantum influenced your practice? Not directly, but broadening my exposure to the practice of others has been invaluable. Continually being in dialogue with a community of artists is crucial to remain informed and relevant in your own way. For me the most fascinating aspect is learning the driving factors behind other artists work. There’s almost a subconscious comparison with my own process that naturally facilitates personal growth. It’s a kind of introspection through the lens of what captivates other artists. What artists, contemporary or otherwise, do you pull inspiration from? I feel like there’s an incredibly specific essence to what I genuinely become passionate about and within that realm, animal imagery never fails to seduce me. I have a tendency to focus on concepts more than individual artists and as mentioned above, the dynamic between nature and our current culture has been a continual fascination of mine. In general I think the artist’s perpetual struggle to find value in a socially irrelevant subject through allegory, metaphor, or narrative is poignant, and psychologically engaging. 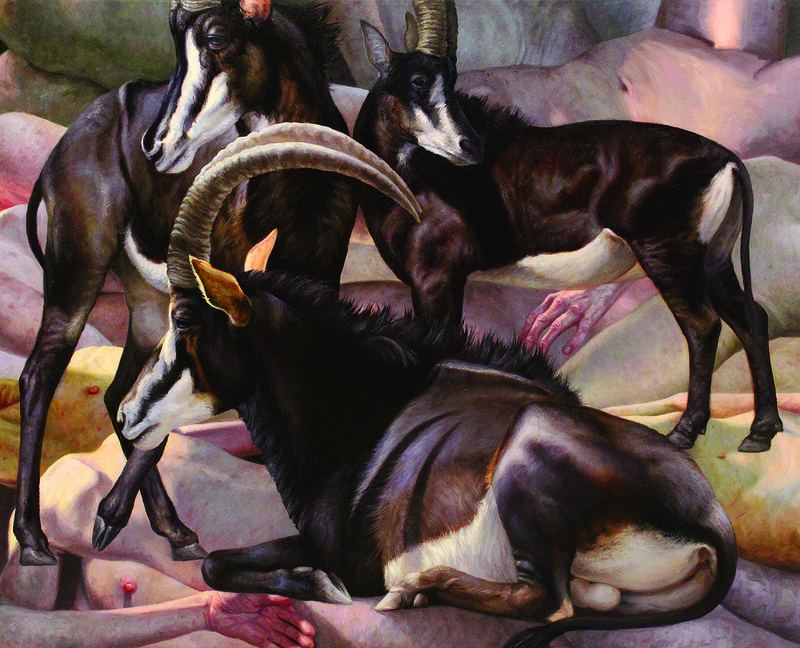 I enjoy Walton Ford’s work for his sense of narrative and myth. 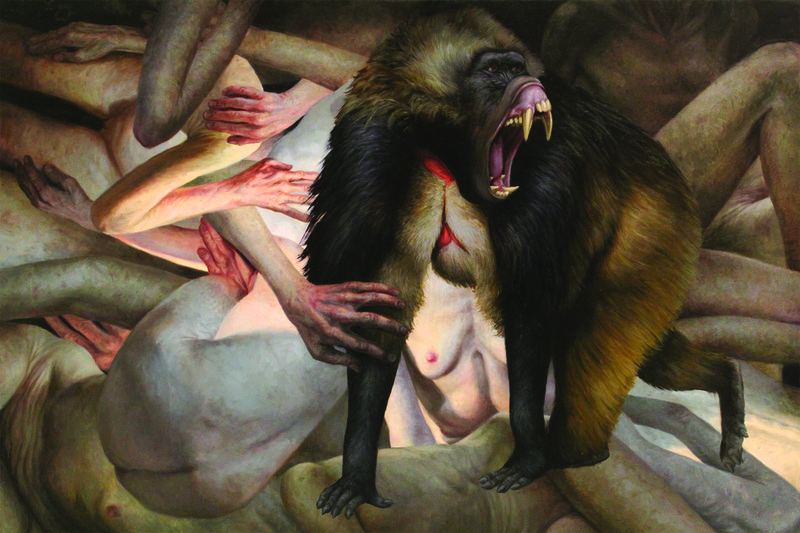 He manages to combine beauty with complex and obscure references throughout natural history and culture. Developing new work and hoping something materializes from it. I’m in a group show opening April 11th titled “Barely Imagined Beings” at Proto Gallery in NJ. Otherwise the future is now.